After testing the XP Deus out a while back, I decided to get one from Gerry’s Metal Detectors – gerrysdetectors.com (best price you will find on the Deus) and add it to my arsenal of machines. After receiving it yesterday, I spent most of the night going over my notes and decided to make a program that would be very sensitive and go deep with the stock 9″ coil. After a bunch of testing and measuring I came up with a program that I hoped would do the job I designed it to do. I took it out today for a test run and found that EMI really loved my new program. 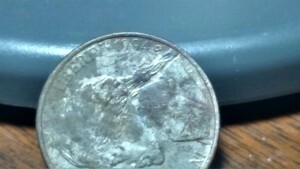 So I made a small adjustment and started listening to just how much chatter one can create with a machine under a powerline..Answer.. A LOT..but I kept working with it and quieted the chatter to a workable level and managed to come up with one wheatie at 8″ down, this 1994 nickel with D sideways ( I am sure it is worth a fortune! 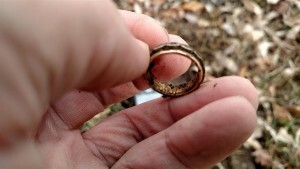 lol) and this nice gold and sterling silver ring at 7′ deep. Not bad for a couple hours testing out a new program. All in all for where I was hunting (a well worked over spot) I think the XP Deus is just what I thought it was, a very good partner for my CTX 3030. What one misses the other seems to find. Thanks Gerry McMullen for getting my machine to me so quickly. Recently I decided to send in my 3 sets of Sun Ray Gold Pro Headphones to get them rebuilt with new ear cups and repair one that was broken last season. Let me say to start with there are several quality brands of headphones on the market and personal preference is just that. When I first started being serious about detecting I purchase the Sun Ray’s from Gerry’s Metal Detectors. Since that time Gerry has added the Killer Bee’s line to the ones he sells. They are made by the same mfg. and come in a nice variety of choices. All are excellent! Now why I decided to write about headphones. In working in the desert detecting for gold I use headphones almost all the time. There is an occasion that I would use speakers for my GPX 5000 on very hot days and if I am in a spot that I am really concerned about needing to hear external sounds but this is rare. The reasons you need a very high quality set of headphones is comfort in the fit and being able to block out external noise and especially wind. When I am hunting I want ALL my concentration on what I am hearing and not listening to the coil scraping the ground. When coin hunting I know a lot of people hardly ever use headphones because they think they don’t need them. Well, in my opinion that is just fine with me because most (not all) detectorist will miss targets when they think they can hear but really are not. That brings me to my point, when I sent in all my headphones I figured I would go without and just use the machine speaker. (Remember I generally always hunt with headphones period) I went out to a yard here in town and began swinging. It did not take long and realize this was a mistake. I had to stop and wait for every vehicle that went by so I could be listening for the deep faint targets. That was a pain and to time consuming so I did have some (good headphones) but not the quality of the ones I use. I went and got them from my truck and it was at that time I remembered why I bought high quality headphones. The sound quality was not there, the noise was not blocked out and they were anything but a comfortable seal and fit on my ears. A very high quality set of headphones is an investment but in my opinion a must if you want to be a very successful detectorist. It is not the only thing to becoming successful but it is on the list. The XP Deus after a couple of months digging targets. I have used the Deus in different areas including a pasture where there was an old town site. At the old town site the trash is horrible and varies from shallow to deep. There are both ferrous and non ferrous targets. Biggest problem there is over burden from feeding cows for years which puts good targets from 100 years ago deep. It was a difficult challenge to find good non ferrous items. I worked some of the sites over again here in town that I have worked over hard with the CTX and did find a few coins that I had missed and nice token next to a piece of rebar where the CTX could not go. I worked a few public easements and have posted some of the items on my Facebook page. Now that being said here is what I think. The machine is good for hunting relic and coins where you are willing to dig EVERY target that is a non ferrous target despite what VDI numbers you are getting. You are going to dig some deep iron along with good targets at depth. But most of us do if you want to be successful. It does separate the ferrous and non ferrous targets fairly good if you run the reactivity up on 2 or 3. When you do set the XP to work in an iron infested area like running the fast mode you loose depth. In my opinion it looses about 1/3 of its depth if you run the machine to react fast enough to hit the good target in very heavy iron. If you sweep non parallel to the DD coil area it will hear the targets better when mixed with iron. The depth of targets you can hear I don’t think is much different from the CTX but without trying the same size coil on both machines so all would be equal I can’t be sure. I only had the 9″ for the Deus. The XP is not real difficult to setup but I don’t think there is a (this is the best) setting that really is correct. You can set it up using the reactivity and silencer along with the frequency. I worked out some settings that I believe are the best in the areas I was hunting. That said I see why the England relic hunters like the machine. You can set it up to hear all non ferrous targets and hit most of them (not all) and get rid on most of the iron by discriminating targets below a certain number (still hearing the iron with a low tone) by running in a 2 tone mode. That however, is a bit of an issue coin hunting in a populated area with all the non ferrous bad targets we have here. As for the VDI numbers. Sometimes they are right on the money depending on depth and if there are any other items being detected at the same time. It does give off a good clear signal on non ferrous items at detectable depths. I have yet to dig a good target when the signal is broken. I love the weight of XP Deus and ease of taking it apart for storage and transportation. The charging system works good and easy to use. The W5 headphones would be my choice if I was using headphones but it works great without them too. 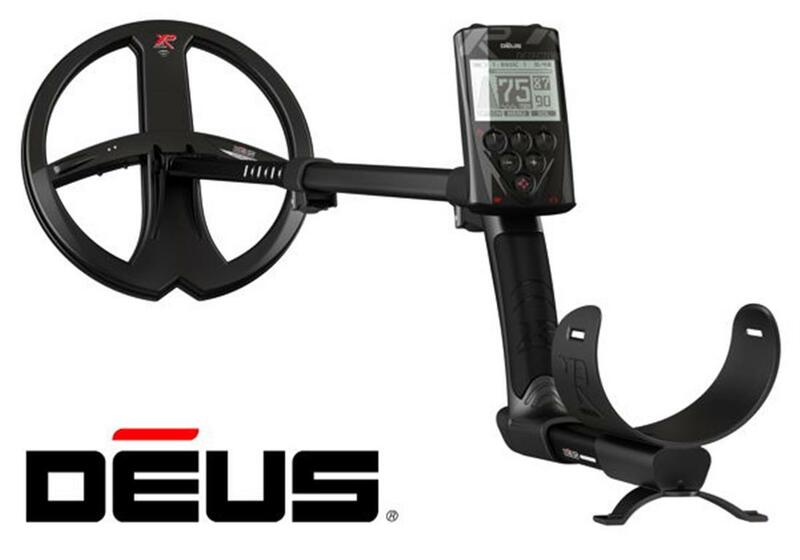 Using the XP Deus along with the CTX is a killer combination. Here is a little something that is worth your time to read and think about. When you make an investment into a metal detector your main goal is SUCCESS!!!! That’s right, you want to earn (find) something with your investment (detector). I’ll provide you with a method that will speed up your chances of having SUCCESS when you take your detector out. You can be one of the few. You know who they are… the guy who you see at the river fishing all the time and he always catches fish. That’s right, you stand shoulder to shoulder, cast the same size of lure, use the same thickness/color of line, even reel the same speed and he still always seems to be the one who catches the fish. It Doesn’t matter what you do… because he is one of those 10% who catch 90% of the fish. Well in gold hunting, it is even more demanding and I’ll bet it is closer to 5% of the detector users who find 95% of the gold. 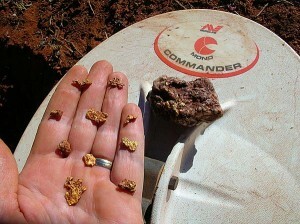 That means 95% of people who own nugget detectors get to split a measly 5% of the gold finds. I don’t like those odds and I hope you don’t either. Here is one of the easiest ways to become a “SUCCESSFUL NUGGET HUNTER”. One of the easiest…yet for some reason… the most seldom done. Are you ready? This is a tough one so get prepared to take some notes and concentrate. Here is my secret to success. That’s its, those 5 simple words will make or break most new detectorist. Lets go into some detail though so you understand more of what point I am trying to get across to you. Take your investment dollars and find a confident dealer who has the write ups, photos, letters and such credentials to prove himself and purchase from that particular dealer. You the buyer make the choice of who the right DEALER is that you want to do business with. This SELECT DEALER, who will do his best to make sure you understand your detector above and beyond what any manual, book or video will show. This SELECT DEALER can show you some areas to hunt and will offer you the exact detector accessories for your style of detecting to fit your personal needs. Why get a bunch of free accessories, when you don’t even know if you’ll need them or not? Why get a free coil, if the area you hunt is not productive for that size coil or its detection pattern? Don’t think a bunch of free accessories is a great deal when in fact it is the detector and the amount of knowledge you learn and training you get that will produce Gold Nugget SUCCESS. My photos of finds are in 3 of the top 5 manufactures catalogs. 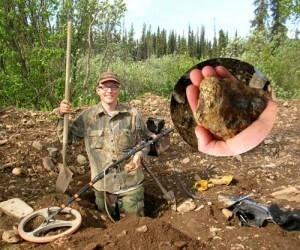 My field training has been mentioned in different prospecting/detecting/gold magazines more than most dealers out there. The best part is that these articles were written by my customers and not me; because I let my customers do my advertising for me. They are willing to show the rest of American that they bought a detector from a SELECT DEALER and that person went above and beyond what the average dealer does. That dealer spent the much needed time and effort to work with the customer both on the phone, email, and in the field to get the correct machine and accessories for the customers needs. Folks, you should try to treat this purchase as an investment and do some homework. You would not normally hand over hundreds of dollars to the 1st broker you find, just because he says he’ll offer free trades. Then why do the same thing with the 1st detector dealer you find, who offers free accessories or a day of training. Do your homework and make sure the dealer you buy from has the credentials that backs up what he offers. Yes, there are (a very few) other dealers who do offer field training, but you are only getting a day of training. My question to you is… Does that person have the credentials to know what they are talking about? Be up front with them and ask the important questions. How often, how long, who will be doing the training? Do they have photos of customers and their finds to back up how well they train? An exceptional dealer will have the stories, photos, and letters of recommendation showing that dealer does indeed offer a special service. Call all the dealers you want and get all the info gathered to see who really does offer you more for your money or the “Best Bang for the Buck”. I’ll go out on a limb and save you some time. There is no other authorized dealer in the United States who will offer you what I can and train as often as I do for you, my customer. Most dealers can not and will not offer to leave their business for 3 or 4 days monthly to take care of their customers. They can not afford the potential loss of sales, and they do not have the time to do such 3 day Field Training on a regular basis. Now compare the 1 day offer to my “3 full days of actual field training” at the same (proven) sites that I myself hunt for gold. I won’t go into details about my training or share my secrets. Those are for the customers who want to invest their dollars with me, and in return I invest my time with them “In the field” where it counts. I’ll just promise you this. At the end of the 3 days, I will ask for your detector, and I’ll try my best to totally mess up every knob, switch and setting. You’ll be able to reset the switches, adjust the knobs, complete the start up procedure on your own, and have the confidence that you know what you are doing. If you fail, then I’ll invest more time with you and offer this. COME AGAIN for 3 DAYS more of FIELD TRAINING and it is absolutely FREE. Find a dealer who knows his detectors like I do, find a dealer who uses custom settings like I do and can prove to you why those settings are better than what the manual says. Find a dealer who will invest time with you (the customer) as much as I will and as often I as train? I seriously don’t think you’ll be able to do that. Find a dealer who will offer you a “FULL ONE YEAR” from time of purchase to get the 3 days of Field Training absolutely FREE. I do this because I realize that not everyone can walk away from their regular job and life at that very moment, so I try to be as flexible as possible but yet want to be serious. I figure that if you can’t find the time to get the 3 days of field training from me (within a year) then you are not that serious of an investor. To be honest, I would rather have serious customers who want to find gold. It is those customers (even though it may be less sales for me) that will become SUCCESSFUL with their investment and show their finds to family, friends, neighbors. It is those customers, who by word of mouth, send more serious customers my way. For those potential customers, who already know your machines and are just trying to buy the detector at a great price… YES I can work with you. YES, I’ll even get you some FREE accessories, but I’ll also try to get the accessories that you need and not of what I want to get rid of. Folks, If you have read this information and are still not totally caught on to… how important my field training is and how important it is to buy from only a select few dealers, then please call me 1 (208) 345-8898 and I’ll speak with you directly. I can be reached most times from 8AM to 10PM MST zone 7 days a week. You have gone this far, so why stop now? I’ll be here ready to speak with you. It will be just me…the same Gerry you get ever time you call. If you think that my sales pitch is a waste, then seriously take a look on Ebay and how many detectors are on there daily. Most of those are folks who bought because of price alone, saved a few bucks, got a truck full of free accessories, and then failed. They went out a few times, found nothing and gave up. Bottom line, their investment lost money, and so to Ebay it goes. Don’t be one of those typical types when you have the chance to be one of the people in my PHOTOS on my wall, in my scrap book, or who I read about because you just found a 2 pound gold nugget. Folks, I am for real and have been for quite some time. Are you serious and for real? 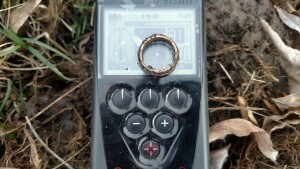 The Minelab CTX 3030 has 3 stock Minelab coils. All of Minelabs CTX Coils are waterproof and fully submersible. 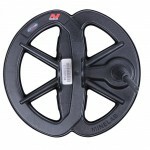 The stock 11” coil is an excellent all around coil for general detecting. I use this coil for most of the sites that I detect. The 11” is very versatile and gives good ground coverage, depth and target ID. What are some of your best finds? The small 6″ coil is my favorite for trashy sites and great for target separation in these type of environments. Have any of you folks used the small coil, what were your finds and thoughts? 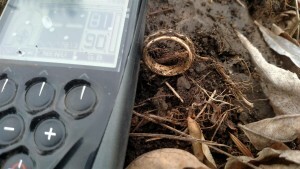 When working in the trashy sites that we have hunted for coins and relics you can’t beat this coil in my opinion. The ground coverage is only about half of that of the stock 11” and that is good and bad. The bad is it takes a lot more time to cover an area with this coil but the GOOD totally out ways the coverage loss in being able to separate the good targets from all the rusty cans and other junk encountered when working mining camps and town sites. It always amazes me how much trash was left scattered over these sites. On that note while you are out detecting pick up your water bottles, drink cans and any other items you brought with you. It always makes me mad when I see trash and bottles just left lying. And don’t bury them either pack it out be respectful of our hobby. Fill in all your holes and leave the land like you found it or better. Pin pointing with the 6” is a breeze. The lite weight of the coil makes it easy to swing all day. You can’t go wrong with this coil. The 6” gets good depth for its size, you will be surprised, I know I was. Give this one a try when you are loosing threshold because of high trash or EMI. The last coil the big 17” is a monster for ground coverage and depth. The first time I put on the 17” I was at a site the I had hit hard with all the other coils. I was detecting for just a few minutes and a clear high tone rang out. About 12” down in the hole was this very nice Barber Dime. I had covered this area many times but had missed it. The 17” hit the dime like it was 3” down coming loud and clear. In areas you have cleaned out go back with coil and see what you missed. I was very glad that I bought this coil. I know a few guys that use the 17” coil most of the time. Thanks for the read and please post your comments, like and follow. Tell me what subject you might like to learn more about.